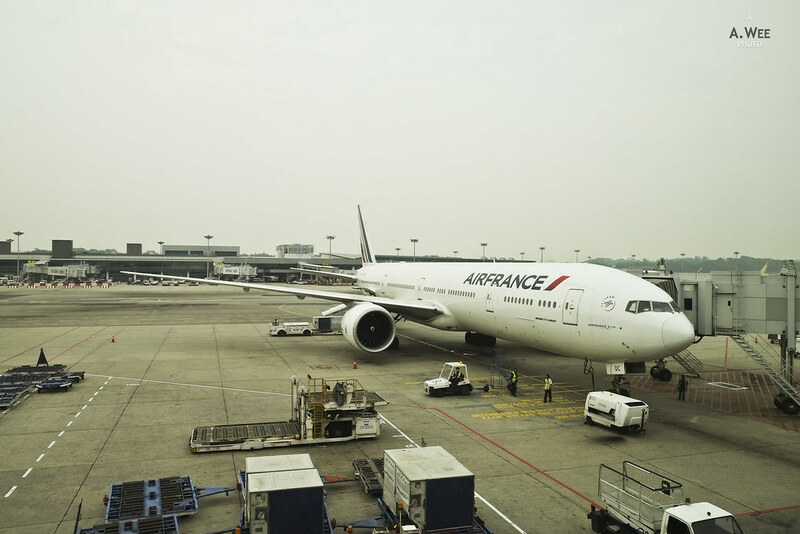 A long time ago, I remember taking Air France’s 5th freedom route between Singapore and Jakarta. Then they did stop it as airlines around the world went into a crisis. 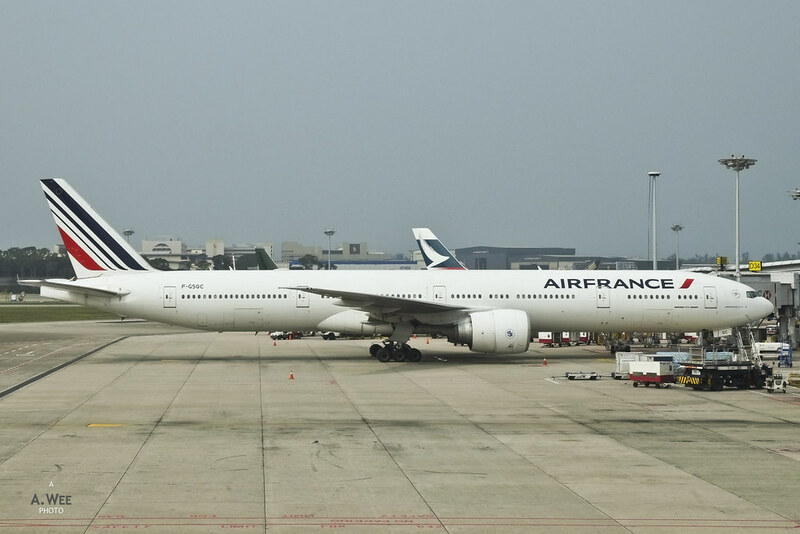 Air France has resumed the flights between Singapore and Jakarta, as I suspect it is also because Garuda Indonesia is now part of Skyteam and could send in more customers to Air France’s way. For some reason the flight was not shown on the TV screen in the airport and some other passengers taking this flight had to get directions from the porters around the check in area. It turns out the check in is located nearer concourse E, closer to Garuda Indonesia which is a Skyteam partner of Air France. With an empty check in desk when I arrived, I was immediately served. Since I had conducted online check-in and had no luggage to deposit, I got my boarding pass easily and the agent also includes an immigration form for Singapore. It was probably one of the shortest check-in experience of my life. Once I passed through immigration, I got myself a complimentary meal set using the bank credit card at Old Town Cafe. Had a nice dinner before I proceed to the boarding gates. Security screening had a few people in the queue though nothing that would delay me. Boarding has already started when I reached the gate, as it appears to be a very orderly process handled by the ground crew. 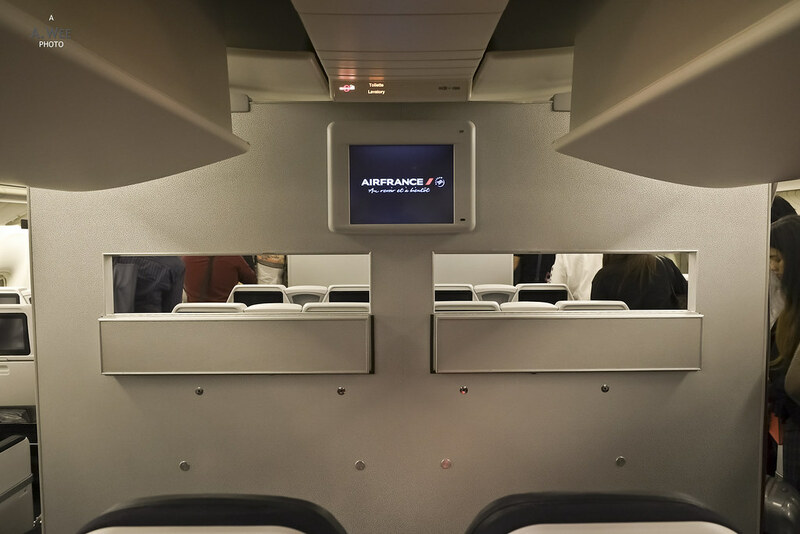 Economy class passengers board through the front so they get a glimpse of the reverse herringbone seats onboard Air France’s 777-300ER. 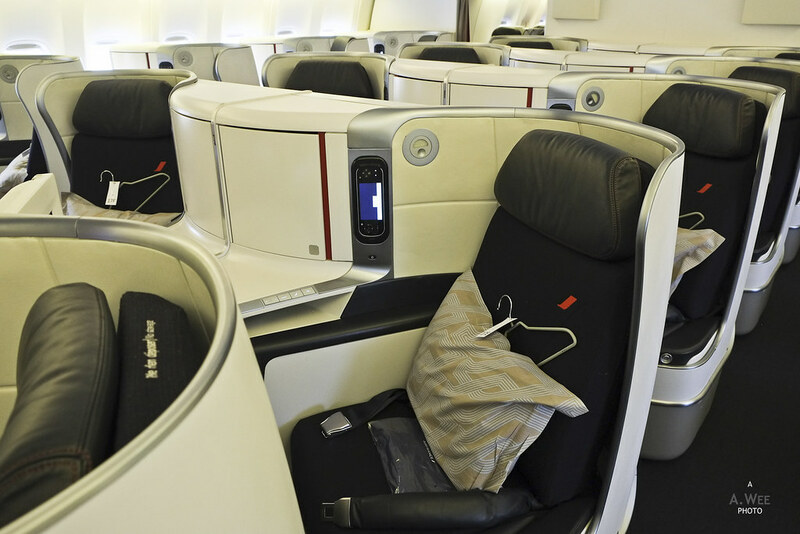 For the record let it be said that not all of Air France’s 777 are fitted with these seats yet, but the cabin is definitely very tastefully done up. 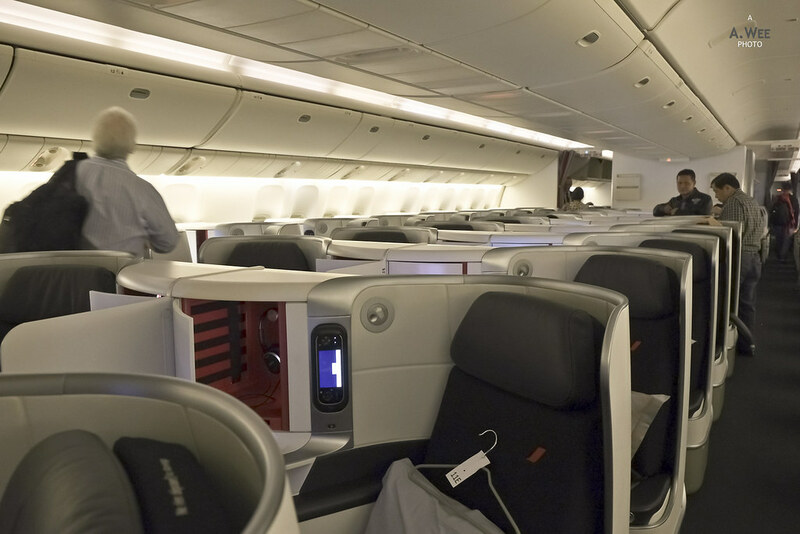 Next comes the Premium Economy cabin which is in a 2-4-2 configuration similar to Cathay Pacific. These seats have a hard shell fixed back which means when the front passenger recline, it would not intrude on your space. 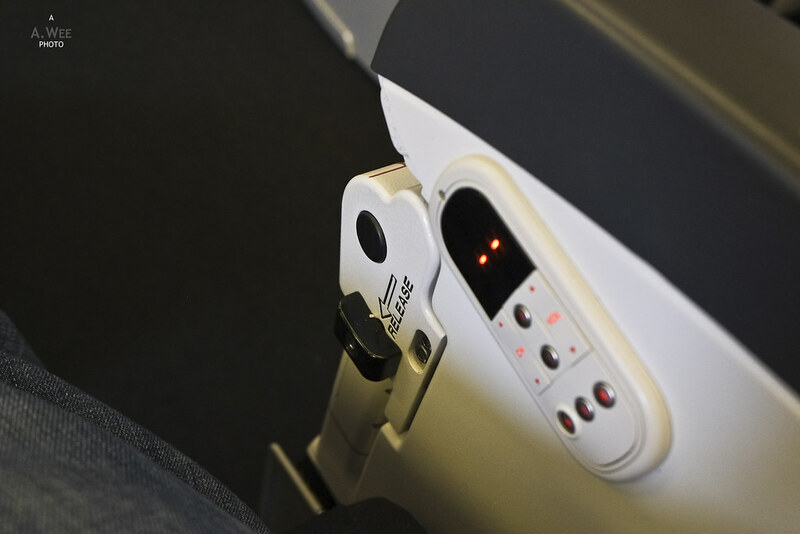 Instead the recline mechanism is via the seat cushion extending forward. 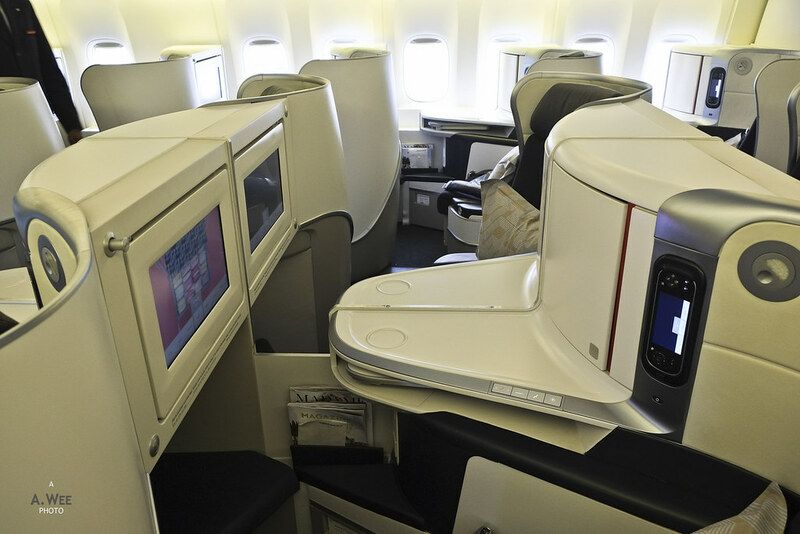 Economy comprises the rear of the cabin and again it was also nicely furnished since it is a relatively new plane. The seats are configured in a 3-4-3 configuration though, which is a high density setup. The premium airlines like Singapore Airlines and Cathay Pacific has a 3-3-3 configuration in economy making the seat narrower than what I am used to. 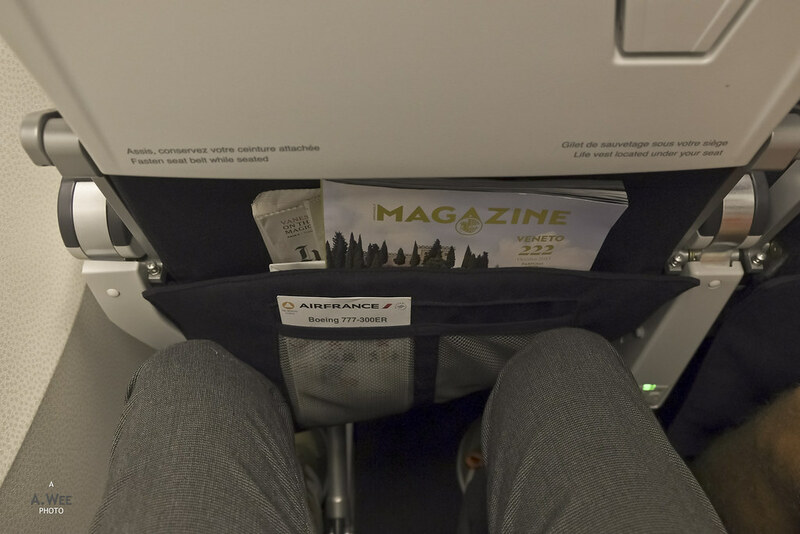 Legroom on the economy cabin is also quite restrictive which can be uncomfortable for long haul flights. On these short one hour odd flights, they are alright I guess. 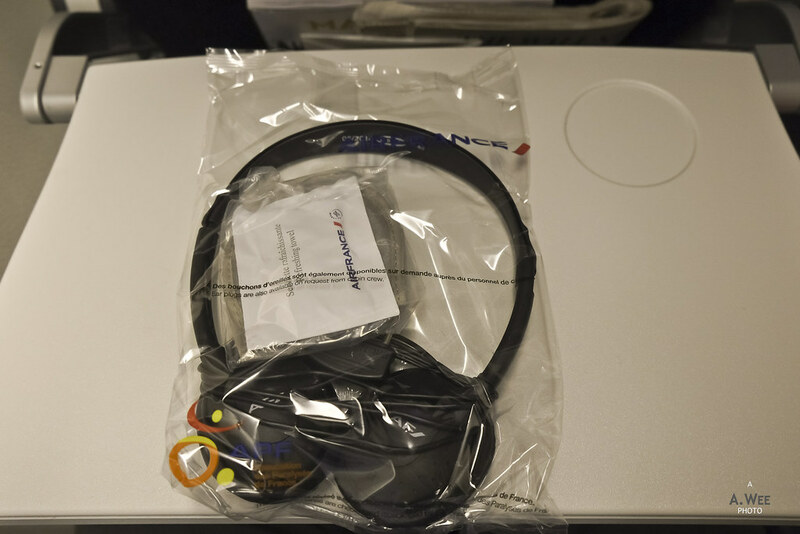 Aside from the dire legroom, Air France provides a small kit of sorts for passengers, containing a headset, eye mask and a refreshing towel. 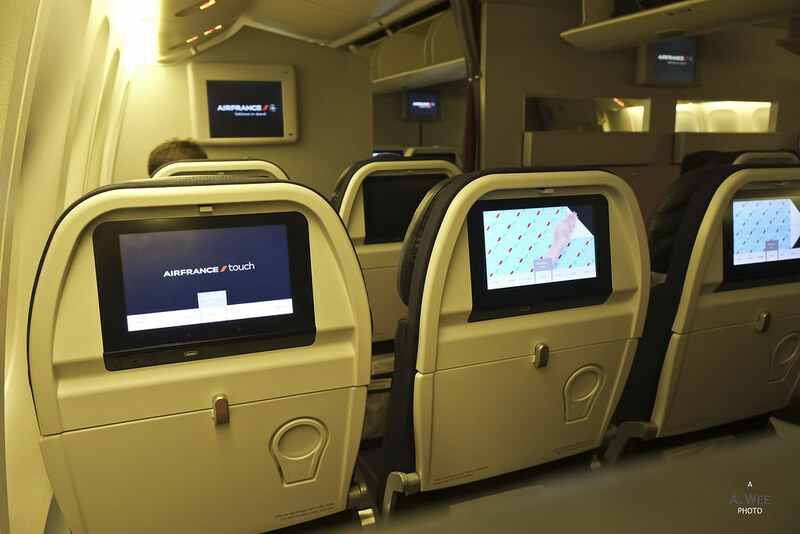 Another positive comment also goes to the nice touch screen monitor onboard these long haul planes that are switched on even when on the ground. 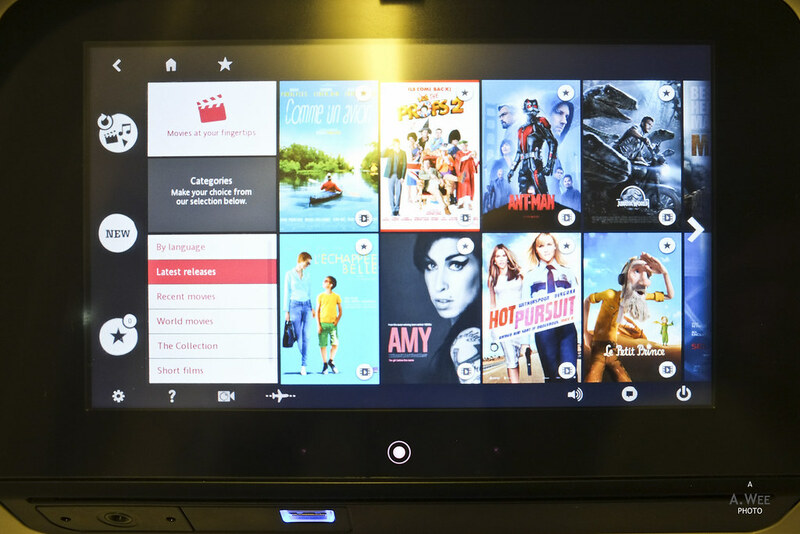 This incentivizes early boarding so passengers can get occupied by starting a movie while on the ground. Below these monitors, there are also USB charging ports, another good amenity to have for a long haul flight. Boarding a 777 takes some time though even if the flight is not that full. Thus there was some time for passengers to spare until pullback when they started to show the safety video. I remember how much I liked the video the first time I saw it, and after taking this 5th freedom flights numerous times, I still do not find it boring. 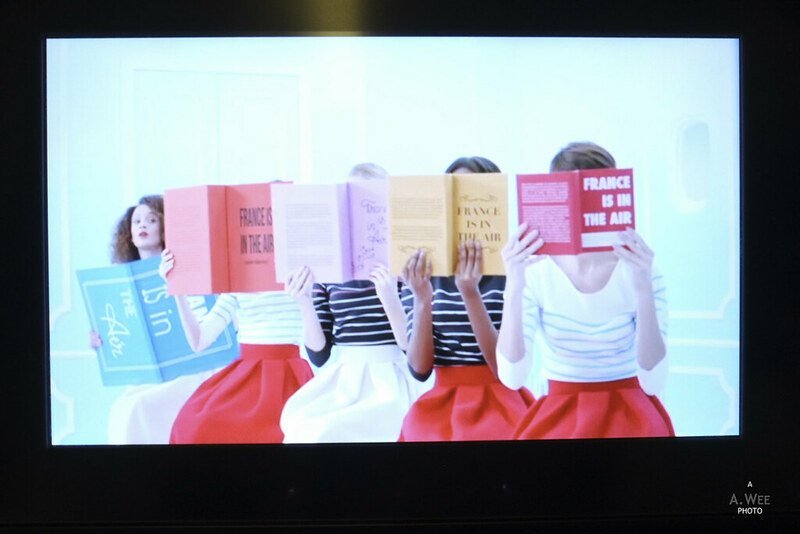 The video was enjoyable in its chic-ness and resonates strongly with Air France as a brand! With the safety video being played, it was time to take-off and flying with the 777 is always a stable way to enjoy the experience. 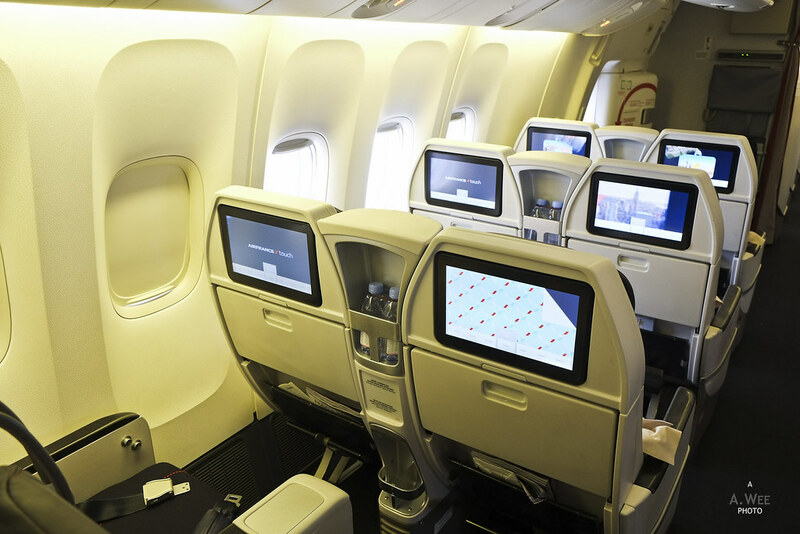 Besides the trendy safety video, the design in the cabin extends to the pillow that is provided on every seat. 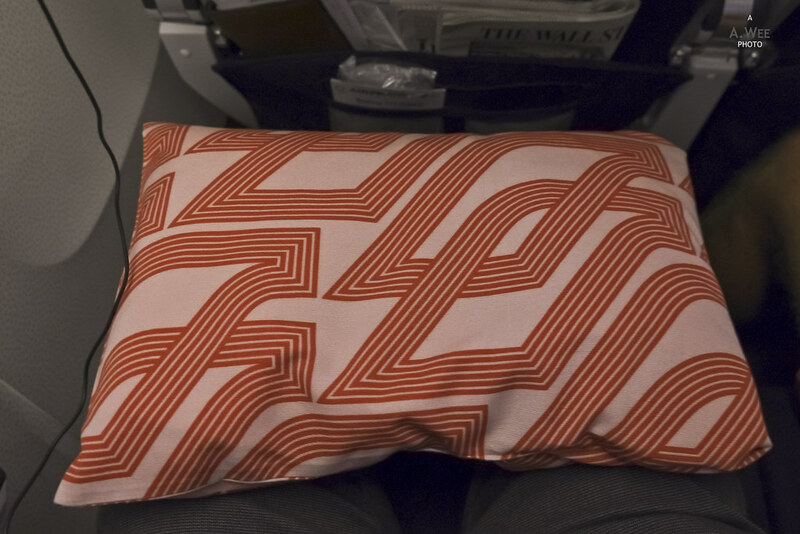 There are numerous designs on the pillow and that enhances the experience for the passenger as it reduces the monotone of the airplane cabin by adding a splash of colour. Upon reaching cruising altitude, the crew got into action as they do serve a light snack for this less than 2 hours flight. There was no choice for the snack unlike Garuda Indonesia or Singapore Airlines that also serves this route. Meal service was a roast duck salad with greens. A portion of Camembert cheese was supplied along with a hard bread and an apricot cake. The salad and the cake was surprisingly good, though the bread being tough was borderline inedible. 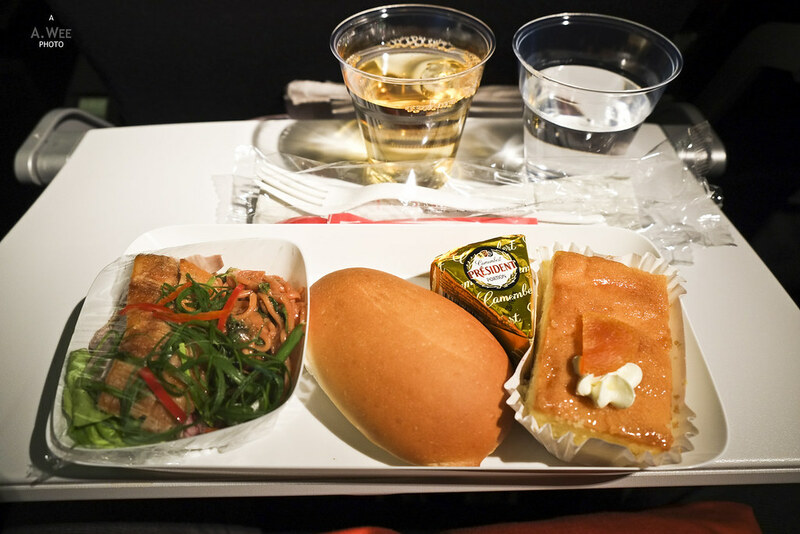 While the portion is quite small, it was actually adequate for the short flight, as long as one does not expect a full meal. As the crew returned to collect the finished meal trays, I was able to ask for beverage refills and even during the meal service, it was no trouble to ask for a cup of water in addition to a juice. 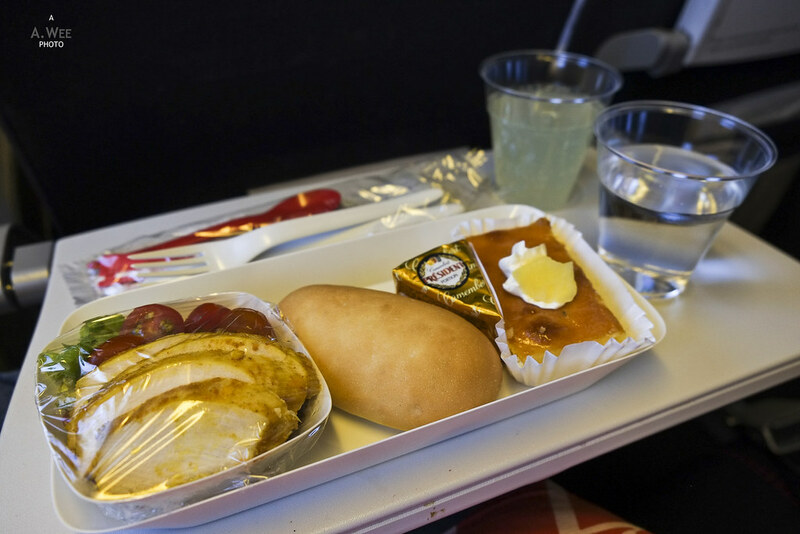 Being a French airline, they serve wines along with the snack service even in Economy class and that is a real treat too! 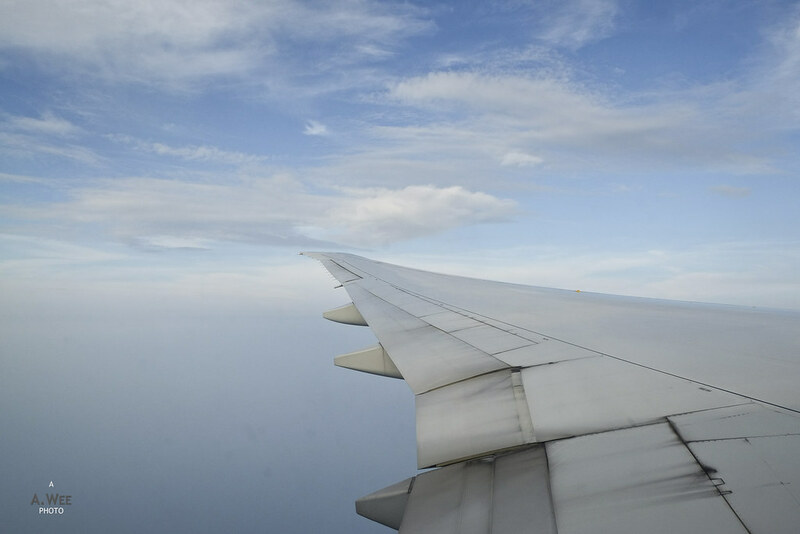 For the first time in years, flying once again with Air France was a pleasant experience. 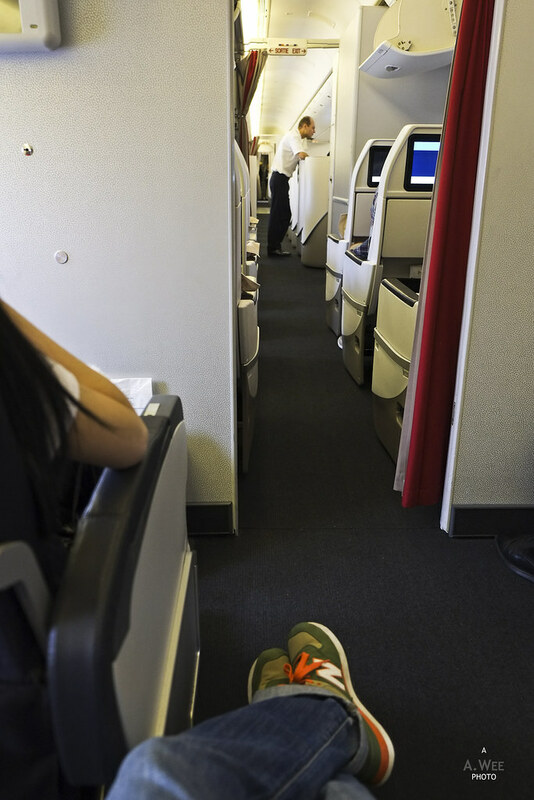 While the crowded Economy class might be a squeeze, it was alright for the short flight. The sense that there was design thought put into the cabin to enhance any sensory pleasure did make this flight interesting. In fact because the fare I paid for the return fare was just $107, the flight made very good value, since I get some Flying Blue miles for it too. For the return flight, I did a mobile check-in after downloading the Air France app, but there was none of the mobile boarding pass on Passbook since Changi Airport does not really support mobile boarding pass as yet. 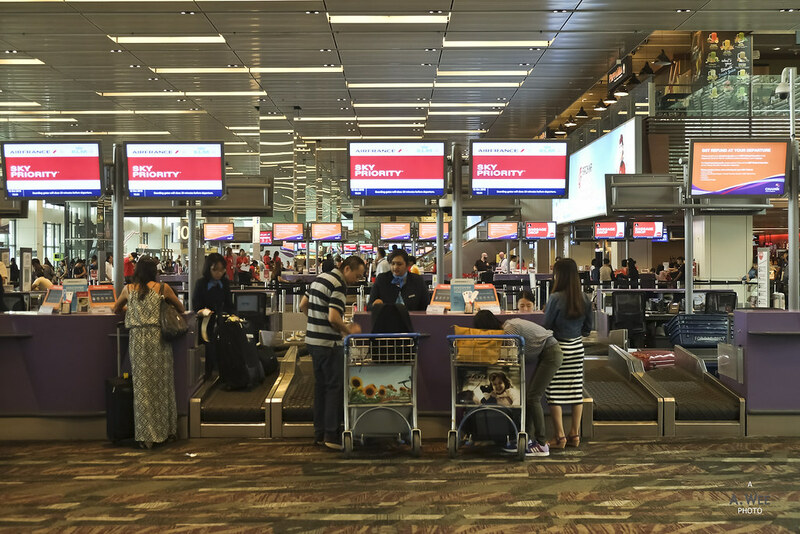 Having attained Sky Team Elite status through Air France’s Flying Blue program, I was able to check in at the Sky Priority lanes in Singapore Changi Airport. 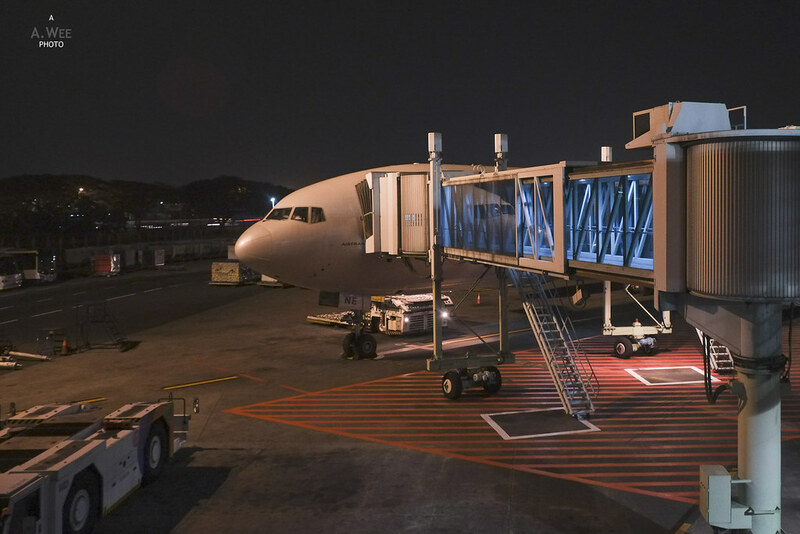 Air France has its check-in on Terminal 1 which has just been renovated recently, and the wonderful experience of flying does really begin in the airport in Singapore. 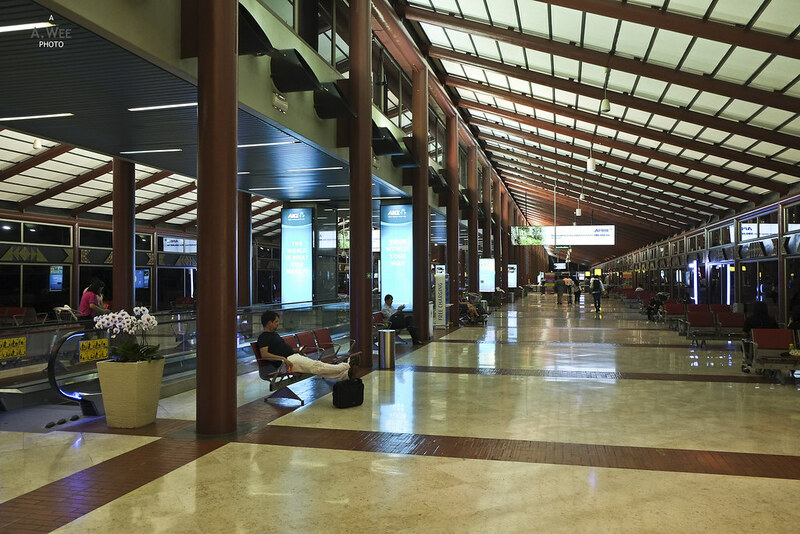 Fast and efficient check-in coupled with a luxurious airport ambience makes air travel a breeze here. Passing through passport control was again another simple affair and I was able to spot the Air France 777 under the late afternoon sun from the main concourse. Singapore does have a nice terminal that permits some airplane spotting and it is also one of the airports where Economy Class travellers can really relax in comfort even without a lounge, as I spend the time browsing the duty free shops and lounging by the seats enjoying the free wifi around the terminal. Boarding the plane was again a very orderly affair and my Sky Priority status enabled me to board the plane early. Like my outbound flight, I walked past the Business Class section again. I must certainly accumulate the miles required for a flight on these seats. Or maybe even better I should accumulate miles for a La Premiere flight! Back at my Economy Class seats, I found myself in a treat as I got assigned what is probably the best seat in Economy Class. That is to be seat 29C, with a mirror seat on 29J. These 2 seats have no seat on its front, which means unlimited legroom. That is because row 28 only has 2 seats on both sides near the windows as it is a bassinet seat. 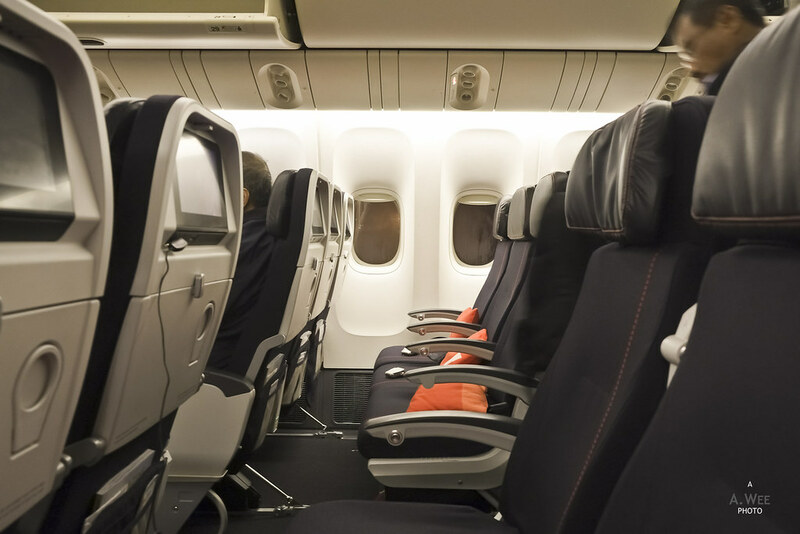 The only drawback to these seats is perhaps the feeling of being too open to the cabin during boarding and the fixed armrest on the right. 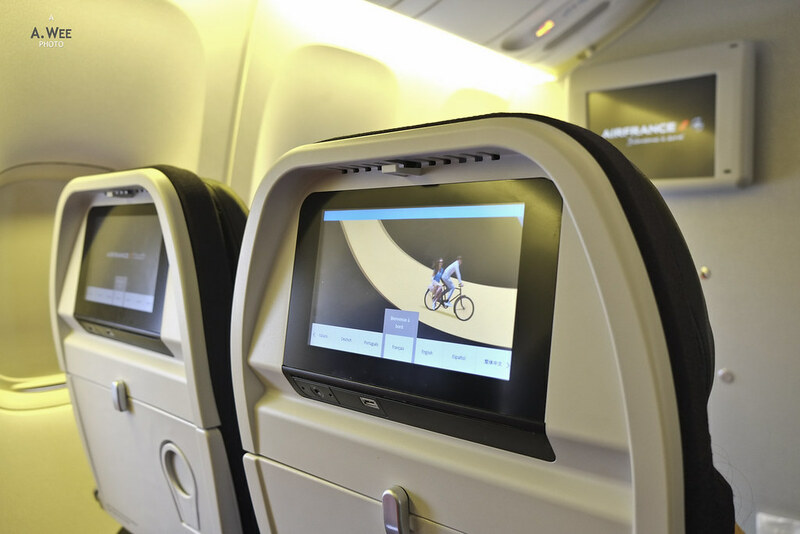 The monitor is also stowed under the seat which limits the viewing time during take-off and landing, since they have to be stowed. Might not be the best for a short flight but certainly makes more sense for this to be a coveted seat for the CDG-SIN leg of this flight. Like the outbound, the crew got ready for meal service and there was no choice yet again. On the tray was a salad with slices of chicken breast. While not as tasty as the duck on the outbound flight, I still finished the portion. Again, they are probably adequate for a snack but not as a full meal. 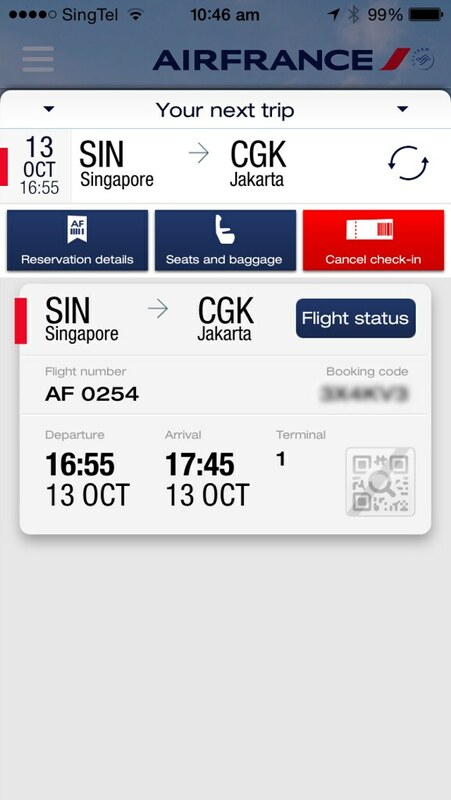 Though with the timing of this flight, it made a lot of sense so that passengers could still get dinner at Jakarta later on. The rest of the flight was once again quite uneventful as the return flight was even more empty that my outbound. I was able to even snag all 3 seats in the same row, so that was really nice. Upon landing in Jakarta, immigration was once again a breeze as it was not crowded and I was able to use the e-passport automated clearance. As I mentioned, these flights were good value for money since I tend to skip some of the meals onboard Garuda Indonesia and Singapore Airlines for these short flights anyway. For the variety, I actually enjoy flights with Air France and the timing of these flights was good for the return though somewhat less useful for the outbound since I arrive in Singapore quite late at night.